Blame John Muir. 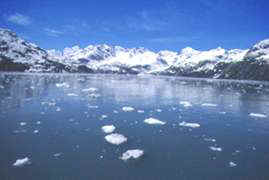 His Travels in Alaska piqued the interest of millions to the fascinations of Glacier Bay. Muir tells of hikes on crevassed snowfields, meetings with Alaska Indians and, most memorably, the sight and sounds of calving glaciers. "When sunshine is sifting through the midst of the multitude of icebergs that fill the fiord and through the jets of radiant spray ever rising from the tremendous dashing and splashing of the falling and upspringing bergs, the effect is indescribably glorious. When a large mass sinks from the upper fissured portion of the wall, there is first a keen, prolonged, thundering roar, which slowly subsides into a low muttering growl, followed by numerous smaller grating clashing sounds from the agitated bergs that dance in the waves about the newcomer, as if in welcome." [Travels in Alaska, John Muir, 1915. The journal recounts Muirs Alaska explorations of 1879-80 and 1890]. I'm among those raptly intrigued by Muir's descriptions, and for decades I had anticipated those welcoming sights and sounds. However, when I arrived at Glacier Bay Lodge on Bartlett Cove, the take-off point for bay explorations, damp clouds shrouded the region and the forecast was anything but encouraging. So my spirits soared like Muir's "jets of radiant spray" when I awoke the next morning to crystalline skies. The Spirit of Adventure, a high-speed, 250-passenger catamaran, took us on a daylong tour of Glacier Bay that left me so breathless I could find time to write only a few journal notes  "glaciers exploding like echoing cannonades with bursts of spray and foam;" "islands lipped with bird life and colonies of sea lions croaking like proud Bavarians;" "humpback whales waving tails like flags as they sounded into the depths." 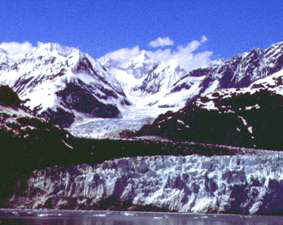 From Bartlett Cove we cruised 65 miles to the tidewater glaciers, always in view of the Fairweather Range, including Mount Fairweather, described by Muir as "the noblest and most majestic in port and architecture of all the sky-dwelling company." The tourist-friendly ship slowed so we could admire and photograph puffins, island-lounging harbor seals, tree-sitting regal bald eagles, porpoises that sliced through the water like graceful water skiers and, most fantastic of all, the grizzlies. Grizzlies trundled along the shore, traipsing over logs, waddling through bushes and weaving through low underbrush. Best of all was a lone grizzly, burly as a sumo wrestler, with legs the size of tree stumps. 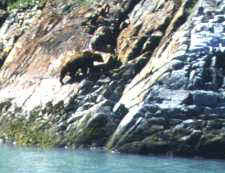 The boat tracked him as he clambered, unperturbed by us or by the rock cliffs over which he was maneuvering. And when his impromptu route dropped into the bay, the grizzly paused briefly, dipped into the water, then lazily paddled along the shore. 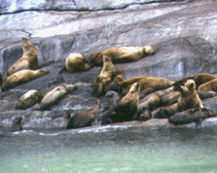 In glacial coves the Adventure cruised close to calving glaciers and slushed alongside floating icebergs, some that served as icy water chairs for harbor seals. 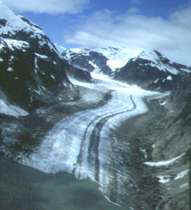 We crept toward dark-striped brown bergs carrying rubble from merging glaciers and others with eerie blue ice. 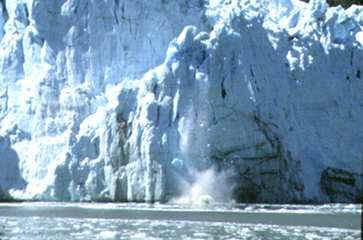 When ice plummeted from the bergs, it peppering the water with cascading thuds, exploding like thunder. The daylong Glacier Bay boat tour was but one of a sequence of sense-exploding explorations that I took in my Southeast Alaska travels. In Haines, the sights were dynamite during an afternoon raft trip down the Tsirku River, a twisty, shallow, muddy stream that in any other location would be unremarkable. 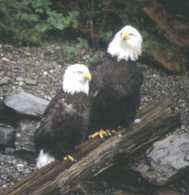 But the Tsirku weaves through the Chilkat Bald Eagle Preserve. Here we followed river bends that curled underneath or alongside more than 50 unflinching bald eagles, some perched on tree tops, others on gravel shores or gnarly logs. A ride on the zippy-fast Fjordland Express hydrofoil from Haines to Juneau included stops to listen to throaty vocalizations of behemoth sea lions. The Fjordland can travel fast, but it also pauses when sea lions, humpback whales or Dall porpoises are in sight. In Juneau, my adrenalin was juiced on a helicopter flight that fluttered just above fractured glaciers, serrated peaks and knife-like ridges before settling atop a knobby ice block. From there we hiked over a portion of a crevassed glacier. At one section I straddled a deep chasm and peered into a crack the color of psychedelic Kool Aid. In Wrangell, another Muir haunt described in Travels in Alaska, I enjoyed the panorama from a small fixed-wing aircraft high above the Stickeen River. The pilot made side jaunts along glacial fields, tilting to provide unobstructed views of toothy glaciers and massive snowfields. The dishpan-colored Stickeen is a river system braided by a spider web of channels and sloughs that's traveled by houseboats, jet boats and sea kayaks. Muirs words on the Stickeen apply equally well to all the wonders of Southeast Alaska, "And so goes the song, change succeeding change in sublime harmony through all the wonderful seasons and weather." 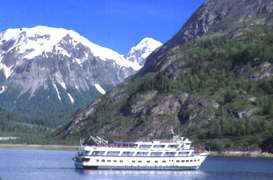 Click here for details to plan your own trip to Glacier Bay and Southeast Alaska.